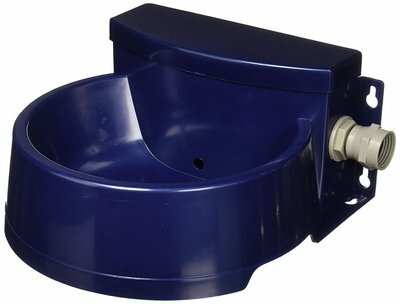 If you have been looking for a drinking water system for your dog or other pets for outdoors then this is a good product to consider. This product can be used inside or outside. It has 2 x one gallon reservoirs with handles making it easy to refill and keeps the water fresh with the dual filtration with charcoal filters. 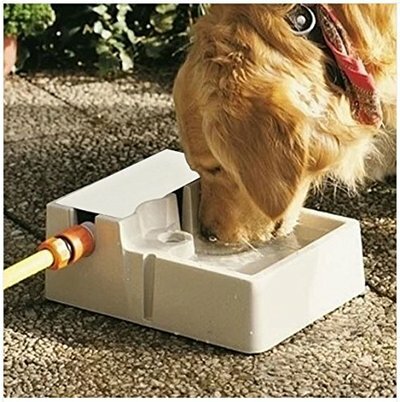 This is a great way to make sure they always have fresh water while outside without wasting tap water. No more slimey water bowls with stagnent water or bugs floating in it. No more turned over bowls that were used for toys instead of drinking. No more missing water bowls. There are no tools needed. It works very well for the outdoor dog or other outdoor pets. There are different types of outdoor water dishes and gadgets for your dog to try. 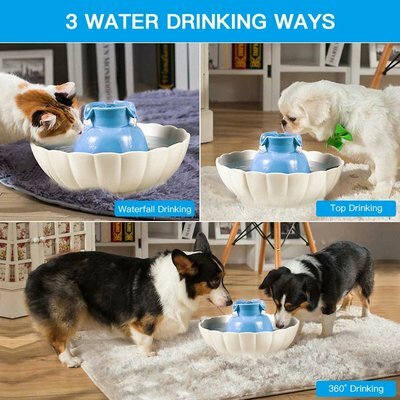 I personally love the idea of the middle one above where your dog steps on it to release water. The hose attaches to this gadget. Others create a reservoir. Click on any of the pictures to find out more. I find online is a great place to find many different models and styles of anything for my dog as there is just that much more to choose from! If your dog spends any time outdoor during the hot summer months, then this is the easiest way to prevent dehydration. Pets always like to be outside with you and as you sip your beverages on the patio or deck, remember that your pets need hydration too! Dogs are always turning over their bowls or drinking from muddy holes. This is an affordable solution. 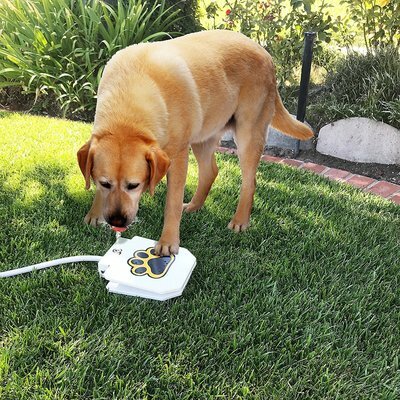 If you want something that can be indoors or outdoors and doesn't attach to a hose, then this indoor/outdoor automatic dog fountain is another great alternative. 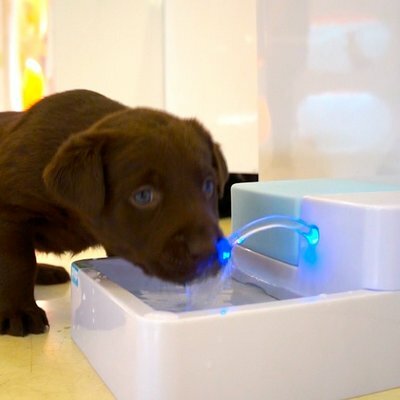 This is a more modern looking water fountain for your dog. 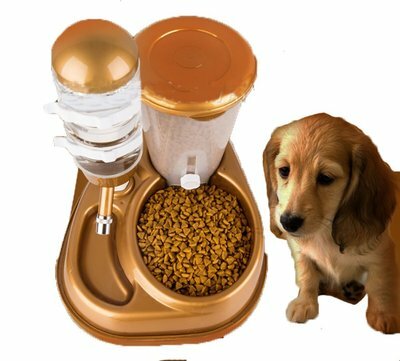 It is off the ground making the height easier for your dog to drink from. You can use this outside and it is weatherproof for the 3 seasons, and then bring it inside for the winter (depending on your climate). It recirculates the water, so there are no hoses attached and it looks sleek. Recircuilating the water is a great way to keep it from going stagnent and will always be fresh for your dog. This product cools and aerates the water to keep it fresh. This also works for cats. It also has a gentle light which makes it look really cool out on the patio at night, and is also great inside as a beacon for your dog. It holds 338 fluid ounces. 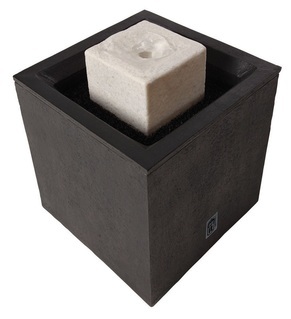 ​So, if you like to sit outside in your yard and like to have your pets out with you too, then this is a great decorative water feature that your dog or cat is allowed to drink from. The trickling water is soothing and the gentle light makes this a great addition to your patio, and also looks great indoors. There are so many ways to make sure your dog or cat or any pet has access to fresh clean water. Even in the cooler weather they need lots of water. The above 3 are more examples of what you can get online. Simply click the pictures to find out more about that product. Shopping online has more variety. It all of course depends on your pets personality as to which would work best, but for outdoors I love the ones that attach to the hose so they have water when they want it without water wastage.